Talking about the natural beauty of Bali will result to no end. Now’ it’s time for adventure in another field. Yes for food! During your travel in Bali, it’s mandatory to try out their local cuisine, some of them are sooo good they’ll leave you with everlasting impression. Whenever you visit Bali, trying their satay is an ultimate must! Usually they sell their satay in a small stall at sidewalks. Most of the stalls are selling pork satay, unless they specifically that it’s a chicken. If you are lucky, you can find good seller whose satays are soft and juicy. Bali, however, has its specialty satay, the locally famous Satay Lilit (Twisted Satay). Unlike any other satay, where the meats are minced in cubes, Satay Lilit uses ground chicken/ pork/ fish meats marinated with coconut and Balinese distinct spices. These dense mixture is then twisted and twined around a thin bamboo stick before grilled, resulting in a very rich smokey flavor of tender meat. Try it! Sucking pig (Babi Guling) is ridiculously popular among both locals or tourists. A whole pig seasoned with turmeric and then filled with a lot more seasons: coriander, lemongrass, garlic, chili, and many other Indonesian seasoning, before roasted for hours at coconut husks, resulting in a tender and flavorful meat. As other main islands in Indonesia are majorly occupied by the moslems, who you won’t find Suckling Pig in any other places than Bali. The Balinese was divided into some hierarchy culture, and those belongs to the priests are forbidden to eat any kind of meat. That’s why vegan and vegetarian dishes are blooming in Bali, especially at Ubud. Vegan restaurants are always within reach—from modest vegan warungs (food stall) upscale restaurant. Wide variety of vegan foods are available at your choice; the simple smoothie in a bowl, the traditional gado-gado salad (mixed vegetables, tempe, and tofu with peanut butter dressing), or fancy mix of raw food you mostly see in Instagram or health channel. Bali is a true paradise for vegan and vegetarian food. A must when you are around Jimbaran, the seafood here is just beyond amazing. Jimbaran beach has long famous for its fresh seafood, and they have grow a lot at its serving. Even though western-style serving are widely available, you should try the local version. Their grilled fish with chili sauce (sambal) is a winner, but the other dishes will tempt you too. Try fried fishes with Dabu-Dabu or other traditional sauce which will leave your palate with wonderful aftertaste. 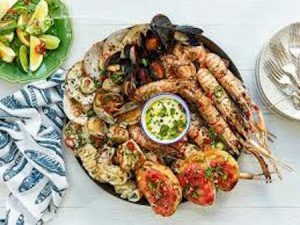 Other than fishes, you can always choose wide range of shrimps, calamari, lobsters, clams, crabs, and many other seafood in various seasoning. Gelato is always a good idea at any day in Bali. The hot and humid climate here is perfect for a cup of gelato, sherbets, and ice cream. Gelato stall is a common sight in Bali, you can even begin a quest to find the most delicious gelato in town. Balinese gelato gallerias has awesome job in incorporating local fruits and delicacies into their product. Forgot the classic vanilla, chocolate, or strawberry; try the distinct tropical flavor that’s almost impossible to find at any other places such as lemongrass, kemangi (local basil), soursop, dragonfruit, coconut pandan, to bamboo charcoal. Be wild!